BARCELONA, Spain, Feb. 27, 2017 /PRNewswire/ — Alcatel today announced the launch of Alcatel A5 LED at Mobile World Congress. The world’s first interactive LED-covered smartphone, A5 LED delivers on Alcatel‘s enjoy.now promise with innovations for energetic young consumers. 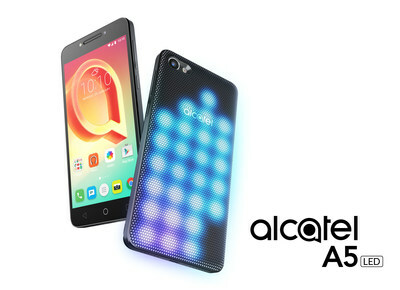 “With the A5 LED, Alcatel is delivering new fun features, like light-up notifications and unique LED cover patterns and themes you create yourself, as well as an enhanced multimedia experience and more ways to take and share selfies, ideal for people who value having fun and letting their personality shine,” said William Dowie, Portfolio Management Director, Alcatel. Light up your notifications with a different light show for important incoming calls, messages, alarms, and social media alerts. Light up your life using Color Catcher 2.0 by creating unique LED cover patterns and themes for a different look every day. Light up your imagination with an eye-catching personalized light show. Light up your music, with light shows that move with your tunes, switching with a simple shake. The A5 LED also gives you a great multimedia experience. It has fast 4G LTE connectivity and an octa-core processor that ensures photos, games, and movies load smoothly to the large 5.2-inch HD display. Alcatel A5 LED also has a 5MP front camera with selfie flash for brighter selfies even in low light. It comes with Face Beauty software for flawless images and Face Show, which lets you turn your selfies into personalized video clips for extra fun. There is also an 8MP rear camera with dual-tone flash. Plus, you can also enjoy Private Mode, with a different sign-in to protect your hidden photos and apps. The Alcatel A5 LED fits comfortably into the hand, with an ergonomic design that boasts a slim profile and rounded edges. For more information on A5 LED, please go to http://www.alcatel-mobile.com/. TCL is a registered trademark of TCL Corporation. All other trademarks are the property of their respective owners. Alcatel is a trademark of Alcatel-Lucent used under license by TCL Communication. For more information, please visit http://www.alcatel-mobile.com.